Educators in the K-12 and adult education milieu, including pre- and in-service educators, are expected to address, in and outside of the classroom, significant political and social issues including increased homelessness, food insecurity, poverty, gender dysphoria, school bullying, and marginalization of the LGBTQ population. Educators seek swift solutions to the situations at hand that will benefit K-12 students. 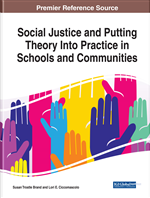 Social Justice and Putting Theory Into Practice in Schools and Communities is an essential research publication that provides detailed research on the creation and implementation of social justice strategies in educational settings. Highlighting a wide range of topics such as gender equality, academic standards, and special education, this book is ideal for educators, sociologists, academicians, researchers, and curriculum designers.